It’s that time of the year again, and you may be considering how to store your caravan for the winter. New owners particularly may have a plethora of questions related to storage which can quickly become overwhelming. However, storing your caravan for the winter properly can help avoid damage and prolong its lifespan, so it’s important to get it right! The majority of owners have two choices. Either keep your caravan on a driveway or in a garage on your property, or keep it in an offsite facility. Both options come with their own benefits and risks. Storing your caravan at home is simple and cheap. You can keep an eye on your vehicle on a day to day basis and it is easily accessible should you need it. However, many driveways and garages will offer limited or no security, potentially leaving your caravan vulnerable to theft. Fitting hitchlocks or wheel locks can help deter thieves and lower your insurance premium. Many people choose to store their caravan in an offsite facility to free up space at home. Whilst some facilities offer ample security others can be very basic. If you choose to store your caravan offsite then do some research and find out as much as you can about the security of the facility. There are several things to look out for such as perimeter fences, CCTV, wardens, access control and lighting. The Caravan Club offers advice regarding local storage sites and you can apply online via the website. Likewise the Caravan Storage Site Owners Association (CaSSOA) offers a range of secure sites throughout the country. 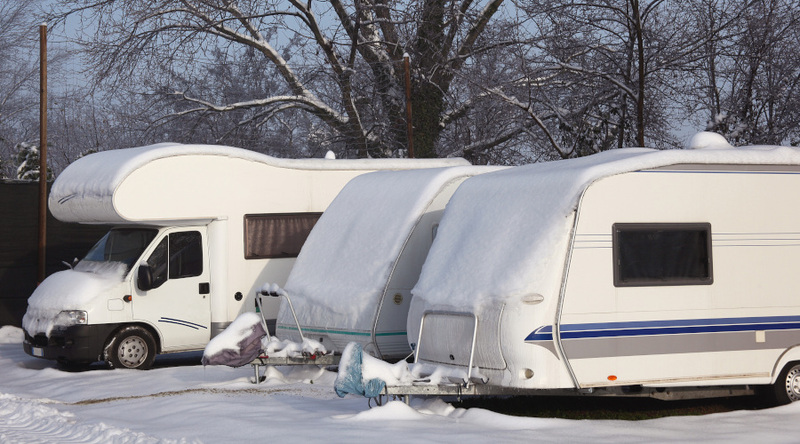 Wherever you choose to store your caravan, make sure you inform your insurer. If you change storage location mid-way through a policy then you’ll need to keep them updated. It may also be a good idea to compare caravan insurance quotes before you commit to a storage location. Obviously caravans are designed to be outdoors, however it’s still not a good idea to leave them exposed to severe weather conditions. As with any vehicle, falling objects like branches, leaves and twigs can damage your caravan. Salt water or sea spray can lead to rust and bird droppings can eventually damage paintwork. It’s a good idea to regularly inspect and clean your vehicle whilst it’s being stored. Remember to use specialist caravan cleaning products, and never use washing-up liquid as this can cause damage. Grease any moving parts, check your car-to-caravan connector and fit a jockey wheel cover for additional protection. Top tip: Take steps to protect your caravan from infestation. Pests like mice or rats can cause significant harm and many insurers may not cover this type of damage. When your caravan is being stored for a significant amount of time it’s important to give it a thorough clean inside and out. Vacuum and clean the interior thoroughly. Try to improve air flow by leaving wardrobe doors open and beds in an open position. Caravans can be particularly liable to mould build up, so it’s important you do everything you can to prevent this. Freezing conditions can cause significant damage so you’ll need to thoroughly empty and drain any water from your vehicle. Be very vigilant and ensure that no water is left inside your vehicle, as even a small amount can do a lot of damage. Finally disconnect the electrics and gas as per the instructions in your guidebook. By taking care to store your caravan correctly you can avoid many problems in the future. You can also reduce your caravan insurance quotes by taking steps to improve the security of your vehicle.